^ Ridpath, Ian. 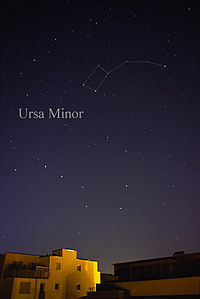 "Ursa Minor". Star Tales. Self-published. Retrieved 7 March 2015. Blomberg, Peter E. (2007). 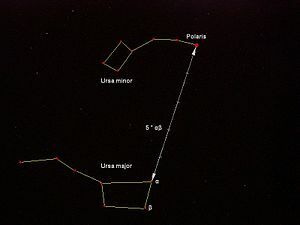 "How Did the Constellation of the Bear Receive its Name?" (PDF). In Pásztor, Emília (ed.). Archaeoastronomy in Archaeology and Ethnography: Papers from the Annual Meeting of SEAC (European Society for Astronomy in Culture), held in Kecskemét in Hungary in 2004. Oxford, United Kingdom: Archaeopress. pp. 129–32. ISBN 978-1-4073-0081-8.